The Extreme Q desktop vaporizer is made by the Canadian company Arizer which is the same company that makes the Air, Air 2, Solo, Solo 2 and the new ArGo vaporizer. Arizer is known for releasing high quality, reliable products at very competitive price points. They have been a favorite among the vaporizer community for years. 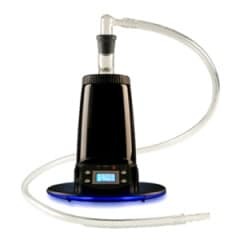 The Extreme-Q vaporizer was released back in 2010 and still continues to be one of the most popular desktop models, especially as an alternative to the more expensive vaporizers like the Volcano, CloudEVO, and Herbalizer. The Extreme Q retails for $239 but you can pick it up from my recommended authorized Arizer store for $149 . This Extreme Q Vaporizer Review will walk you through the basic features, talk about the different options available and also compare it to some of the other popular desktop vaporizers. You can also check out the Extreme Q Review video above to see my step by step tutorial on how to use the Extreme-Q desktop vaporizer and also watch a quick demo session. 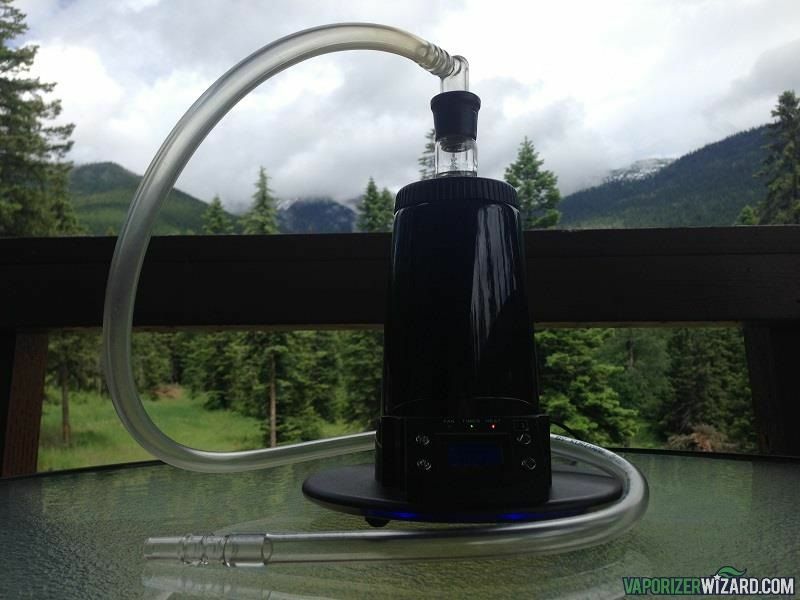 The Extreme Q is what is called a “multi-purpose” vaporizer. It has the option to fill bags through a forced air system or you can use a whip. The whip can be used in a couple different fashions. You can use it by “direct draw” which won’t be assisted at all (No fan). You will use your lungs to draw heat over the chamber and get vapor through the whip. You can also use the whip with forced air. Basically the same way you would fill the balloon but instead, you are using the whip. The Extreme Q comes standard with a digital temperature display and remote control. You can adjust the temperature easily by pressing buttons on the display or using the remote. This vaporizer is really the best of both worlds. I know a lot of people that prefer whip style vapes over balloons. You can adjust the temperature down to single degree if you want to get that precise but I have noticed that you should run a little higher than normal because the chamber sits higher than the heating element. So in order to get the best vape temp, you should set it around 372 degrees. This unit is fairly easy to clean but it does come with multiple whips and screens so it is a bit time-consuming. I’ve also noticed the glass chamber that sits above the heating element tends to get pretty hot with prolonged use and the bags tend to take quite a bit longer to fill when compared to the Volcano, BUT you’re also paying a fraction of the price. The vapor quality from the whip is decent and I found it best to use the assisted forced air on the lowest fan speed setting to get the best results. The other thing I noticed was the amount of time it takes to fill the balloons. On the slowest fan setting, which gives you the best vapor quality, it takes about 3 ½ – 4 minutes to fill completely. You can bump it up to fan speed three which will knock down the fill time to about 1 ½ minutes. But when I did this I noticed the vapor quality became less dense and not as satisfying. At least I felt it was nowhere near the vapor density of a Volcano balloon. On the plus side, it was a bit quieter than the volcano when filling the balloons. Warranty Info: The Extreme Q comes with a lifetime warranty on the ceramic heating element and a three-year warranty covering defects in materials and workmanship. Overall, the Extreme Q comes standard with some pretty great features like the digital temperature display and the included remote control. It also provides the user with multiple options being a multi-purpose vaporizer. Like I mentioned earlier, some people do prefer the whip over balloons. You get to choose between the forced air balloon and the whip option. You can click here to buy the Extreme Q from the same place I get mine and they are an authorized dealer so you know the three-year warranty is valid. Personally, I prefer the vapor quality from the volcano balloons but if you can’t quite shell out the cash for the volcano then the Extreme Q is by no means a bad vaporizer. The Extreme-Q is one of the best desktop dry herb vaporizers on the market especially for the price. It is also fairly inconspicuous, so you could leave it in the kitchen and not too many people would know what it is. The blue glowing LED on the bottom and the remote control are nice features… they just aren’t really needed. If you think that something more portable would be better for your needs, check out my Pax 3 review or the Firefly 2 review if you want something portable that can do herbs and concentrates. Hey guys Buzz here with VaporizerWizard.com. Today I will be going over the Arizer Extreme Q desktop vaporizer. This is made by the same company that makes the arizer solo portable vaporizer. The current price at the time of this video is $239. You can click the link below in the about section to get the current price and a full review on my website. Now the Extreme Q is what is called a multi-purpose vaporizer and what I mean by that is that the unit can used with both whips and bags. Now this unit is the best bang for your buck if you’re looking to pick up a desktop unit. Other desktops might perform better with the whip or the balloons but they won’t offer both options. It’s pretty well made, east to maintain and comes with an easy to read digital temperature display. There are a couple downsides to this unit which I’ll get into later but like I said before, without jumping to the volcano, this is the best desktop vaporizer for the price. So first I’ll show you some of the features and how to use the extreme q. I’ll do a quick vape session, tell you what I like and don’t like about the extreme q and then suggest the best place to pick one up. Ok so here is the Arizer Extreme Q. This vaporizer comes with many options and accessories including the ability to use it with a whip or a balloon. It’s simple to use and easy to maintain. The Extreme Q also has a pretty good warranty. Arizer offers three years of coverage against defects in materials and workmanship and a lifetime warranty on the ceramic heating element. It comes standard with great features like a digital temperature display and also includes a remote control. So let’s jump in to how to use the Extreme Q.
I wanted to show you how to use the Extreme Q without the remote, so to turn on the unit press the power button on the bottom left. Use the up and down arrows to adjust the temperature. The small numbers are the desired temp and the big numbers are the actual temp. Press the M in the upper left corner to get to the menu. Here you can adjust the sound, the sleep timer which ranges from 30 minutes to 4 hours. You can also set the default temperature for when the unit turns on. I recommend 392 degrees F. Next you can adjust the Fan speed starting with fan speed 1 which is the slowest, fan speed 2 is medium, and fan speed 3 is the highest setting. You can also turn on and off the blue LED that glows under the unit. Here is a brief demo with the blue LED’s in the dark and in the light. It’s not really needed but it does look cool. Lastly you can toggle between farenheight and Celsius. The red LED on top means the unit is heating. The blue led means the fan is on and the yellow led means the auto shut off timer is activated. Now to begin your session, you can click the power button on the remote to turn the unit on and it will automatically begin heating to your desired temperature. Grind up your finest dry herb and then grab the cyclone bowl. Place a small layer of herbs in the bottom of the screen. Make sure the rubber padding is on top. The rubber padding is supposed to help with the temperature of the glass but it doesn’t do a very good job. Place the glass side down on top of the heating element. Here’s a good view from the top so you can see the glass slide over the top of the heating element. Like I mentioned earlier, you can use the balloon or the whip option. The first option I’ll show you is the balloon. The first thing you will grab is the mini whip. It comes with a little screen in the bottom to stop the herbs from getting into the balloon or whip. It easily pulls out for cleaning and maintenance. You’ll then place the screen side into the top of the cyclone bowl. From here you can slide the glass mouthpiece into the mini whip. It’s a pretty snug fit. I never have to worry about it coming out during filling or any other time. From here you would pick your fan speed and wait for the balloon to fill up. You would then detach the glass mouthpiece and begin your draws. The mouthpiece doesn’t have a valve system to stop vapor from coming out so you’ll need to place your thumb over the end. Ok so the next option is the whip. The whip is 3 feet in length with an elbow connector on one end and a glass mouthpiece on the other. The elbow connector includes a screen just like the mini whip. It can be easily removed for cleaning as well. Slide the glass connector into the top of the cyclone bowl. Now there are a couple different options when using the whip. You can use it without the assisted air flow or with. I personally like to use the whip option on fan speed 1 which is the slowest just to get a little more vapor per draw. This is just my preferred method, I’m sure everyone will have a different preference with the whip. The Extreme Q also comes with a glass stirring tool. This is used to stir up your herbs after a couple draws or balloons. This helps get a consistent vape of your herbs and also helps with the overall quality of your sessions. Now one of the downsides to the Extreme Q is the Cyclone bowl. It gets extremely hot if you leave it on top of the heating element for a long period of time. So I picked up a test tube clamp off Amazon for a couple bucks to fix the problem. Ok so here is a vape session with the Extreme Q. I’ve already loaded up the Cyclone bowl with some finely ground herbs. I’ll go ahead and start off with the balloon option. So just attach the mini whip and then insert the glass mouthpiece into the tube. Now I’m going to fill this balloon on fan speed 1 which is the slowest fan speed so you can see the vapor quality and density you can expect from the Extreme Q. This is the slowest fill time but I’ve found it to produce the best results. During my previous testing, the Extreme Q took 3 minutes and 24 seconds to fill on the slowest fan speed which is fan speed 1. It took 2 minutes and 18 seconds on fan speed 2 and it took 1 minute and 58 seconds on fan speed 3. Fan speed 3 was the weakest vapor quality while fan speed 1 produced the best quality and vapor density. As you can see here it took about 2 minutes and 31 seconds. This demo was a little faster because I didn’t let the balloon fill completely. Ok so now that the balloon is full, go ahead and shut off the fan. Then detach the glass mouthpiece from the mini whip tube and be sure to place your thumb over the mouthpiece to stop vapor from escaping. A little bit of vapor always escapes here for me which is unfortunate. It would have been nice for them to include some sort of stop or valve system like the Volcano’s. You can also detach the mini whip from the cyclone bowl but it’s not necessary. I found that it’s much easier for me to just leave the cyclone bowl on the heating element for the entire session. It was a pain to remove the bowl after each balloon mostly because the bowl itself gets way too hot to remove with your hands. The test tube clamp works well but you still have to set down an extremely hot bowl somewhere so I just leave it in place for the entire session. This is a much different set up compared to the Volcano. With the Volcano you can load the chamber, fill a balloon and then remove the chamber without worrying about the heat. Plus you can save those herbs for later. If you just put the cyclone bowl on immediately before your session and then remove it immediately after then it might not get too hot but it’s still not worth burning yourself over. Now with the balloon option, I typically get between 4-7 draws from a full balloon. The vapor quality and density completely depend on the temperature, your herbs, and which fan speed you are using. I always vape at around 392 degrees with the Extreme Q which is a little higher than normal vape temps. This is because the heating element and the actual placement of the herbs are separated by about ¾ of an inch. So although the temp of the heating element may say 392 degrees, the actually temp at the herbs will be a bit less. And then I always recommend stirring up your herbs after a balloon or a few whip draws. Now the next option is the whip. With this you’ll just attach the glass connector into the top of the cyclone bowl. Now you get to use the whip a couple different ways. Like I mentioned earlier I normally use the whip option on the fan speed 1 which is the slowest just to get a little assistance. This usually helps me get bigger draws with a bit more vapor density. In this vape session, I just use my lungs without the assisted air so you can see what it looks like. To use the whip, just hit it like a normal vaporizer. It should be a long slow draw for about 10 seconds or so. You won’t see big clouds with the whip option or at least I wasn’t able to produce any dense hits, but it was good quality and I felt like I could just set it on my desk and use the whip attachment all day long. Also the whip option is nice to use with friends over. It can be easily passed around a circle and enjoyed by everyone. It’s much faster and easier than having to wait for balloons to fill. When you’re finished with your session you can detach the whip from the cyclone bowl. Be careful here if you are using your hands to remove the bowl because it will be very hot. Overall I have to say that my favorite way to use the Extreme Q is the whip option. I didn’t really like having to wait 3 minutes for a balloon to fill and I was able to get instant satisfaction from the whip option. Now the vapor density was much better with the balloon but the whip option was super convenient. So now I’ll get into the pros and cons. First of all, the Extreme Q is the best of both worlds because it offers multiple options. You get the Whip and the Balloon. Like I mentioned earlier, it may not be the best at either but it does offer both options. It’s also very easy to operate with the digital temperature display and included remote control. It’s also aesthetically pleasing. The Extreme Q looks like a regular household appliance as long as the whip and cyclone bowl aren’t attached. The 3 speed fan is much quieter than the Volcano but it takes a lot longer to fill balloons. Also the price is another pro because of everything that comes included with the Extreme Q. 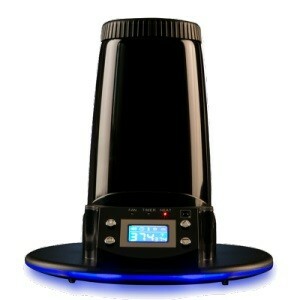 You can’t beat $239 for a good desktop vaporizer with all the accessories and options that comes with it. Now the cons start with the Cyclone Bowl. If you leave the bowl on the heating element for long periods of time, it will get very hot. Hot enough to where you shouldn’t touch it or it will burn you. I was able to fix this issue by picking up a cheap test tube clamp off amazon that you saw earlier in my video. The next con is the fill times for the balloons. In my testing I found the fastest fill took one minute and 58 seconds on the fastest fill speed. It took 3 minutes and 24 seconds to fill on fan speed one which is the slowest. However the density was much higher and I also got more draws. The remote and blue LED are not really needed but definitely earn some style points. Also, when using the balloon option, there isn’t a valve system to stop the vapor from escaping. You have to put your thumb over the end of the mouthpiece which is a pain, but not a deal breaker. So I’d like to thank you for taking the time to watch my Arizer Extreme Q review. If you are interested in buying this vaporizer, you can click the link below in the about section to get the best price through an authorized dealer. If you like this video, please don’t forget to like and subscribe to my channel. I’m currently in the process of making more vaporizer reviews, cleaning videos and tutorials. If you have any questions, comments or suggestions, feel free to leave them below and I will try to answer everything as quickly as possible. Thanks for watching and have a great day. It was on the list and just never really got around to it. It’s crazy just keeping up with all the new ones coming out lol. Definitely on the list though. Edit: I have now had the Plenty for over a year, but have not finished my review yet. The Plenty is a really enjoyable unit to use, but it is an herb-hog and a heavy hitter so it’s definitely best for people with medium to high tolerance. Hey Douglass, after seeing vaporizer clones using leaded solder, and toxic glues, I refuse to try any clones units for my own health. If you need to buy a cheaper unit, I strongly recommend you buy something like the Xmax V2 Pro ($59 with coupon XM), the Boundless CF ($129) or go for the Arizer Air ($169 with coupon ‘AIR’) instead of taking a chance breathing through a counterfeit unit. How much weed does the chamber hold? You can load over a gram in the bowl if you want, but I generally load much less.